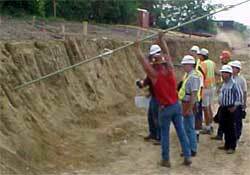 Stability berms are commonly constructed where roadway embankments cross soft or unstable ground conditions. Under certain circumstances, the construction of stability berms cause unfavorable environmental impacts, either directly or indirectly, through their effect on wetlands, endangered species habitat, stream channelization, longer culvert lengths, larger right-of-way purchases, and construction access limits. Due to an ever more restrictive regulatory environment, these impacts are problematic. The result is the loss of valuable natural resources to the public, lengthy permitting review processes for the department of transportation and permitting agencies, and the additional expenditures of time and money for all parties. The purpose of this project was to review existing stability berm alternatives for potential use in environmentally sensitive areas. The project also evaluates how stabilization technologies are made feasible, desirable, and cost-effective for transportation projects and determines which alternatives afford practical solutions for avoiding and minimizing impacts to environmentally sensitive areas. An online survey of engineers at state departments of transportation was also conducted to assess the frequency and cost effectiveness of the various stabilization technologies. Geotechnical engineers that responded to the survey overwhelmingly use geosynthetic reinforcement as a suitable and cost-effective solution for stabilizing embankments and cut slopes. Alternatively, chemical stabilization and installation of lime/cement columns is rarely a remediation measure employed by state departments of transportation.